A reminder that it’s not just humans involved in war, the small but distinctive Imperial Camel Corps monument commemorates the role dromedaries played in the Middle East during World War I. Raised in December, 1916, the Imperial Camel Corps Brigade fought in the Sinai and Palestine during the war and its four battalions were eventually comprised of British, Australian, New Zealand and Indian troops. It was disbanded at the end of the war. 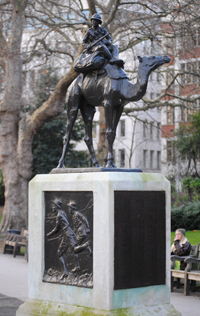 The Grade II-listed monument, located in Victoria Embankment Gardens, was designed by Scottish sculptor Cecil Brown, himself a World War I veteran, and features a bronze soldier mounted on a camel set on a Portland stone pedestal. It was unveiled on 22nd July, 1921, and, on bronze plaques on the side of the plinth can be found the names of those soldiers who died in battle as well as a list of all the battles and engagements fought by the corps. For more on the history of the corps, see the Australian War Memorial’s page. 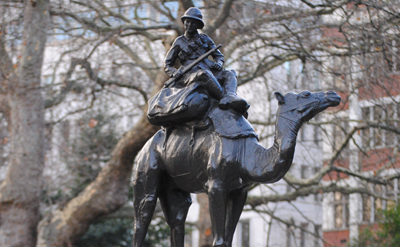 The statue may not be an adequate remembrance of the Imperial Camel Corps Brigade who fought in the Sinai with its heroic soldiers from British, Australia, New Zealand and India.